Yrvind shows the length overall of his new boat. Yrvind shows his boat Yrvind.com to the Swedish Atlantic Rower Niclas Mårdfelt. The boat is used as measurement to show the size of Yrvinds next boat. 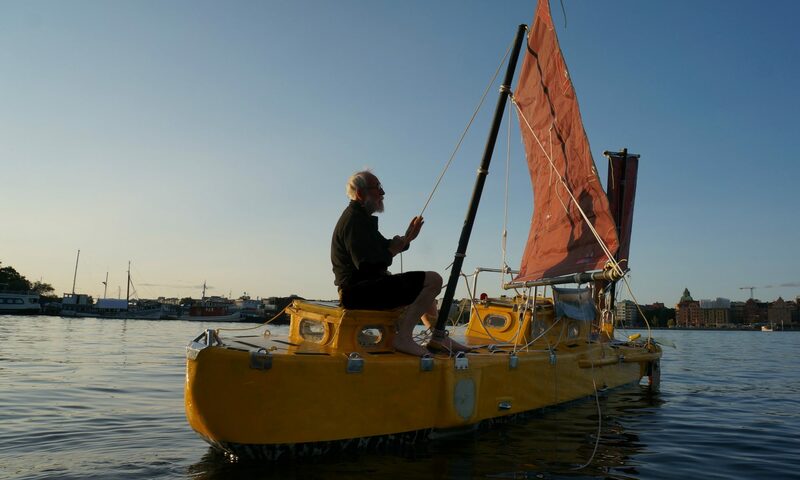 A boat that will be used to circumnavigate the world non-stop. The boat is smaller than 10 feet. The film at the top of present project shows a prototype of the project Yrvind Ten. Another film showing this scale model can be seen here: scale model in 1:20. The model is tested in weather conditions that in the right scale would be equal to hurricane winds. If you are interested to hire Yrvind as a speaker you can reserve him on line at Sveriges Talare. If you are curious you can se a movie trailer when he gives lectures. Take a look under the link “lecture” above!